The canon of Stephen King adaptations has given lots of great actors the opportunity to swing for the fences through his stories of grief, terror, and trauma. The casts of films like Misery, The Shawshank Redemption, and Carrie earned Oscar attention for playing characters created by the prolific horror author, while films like The Shining and IT (both the mini-series and the recent re-adaptation) featured iconic unhinged performances. That tradition continues with Paramount’s new adaptation of Pet Sematary, which stars a knockout cast including Jason Clarke, John Lithgow and Amy Seimetz in the devastating tale of a family thrust into tragedy by their own fear of mortality. 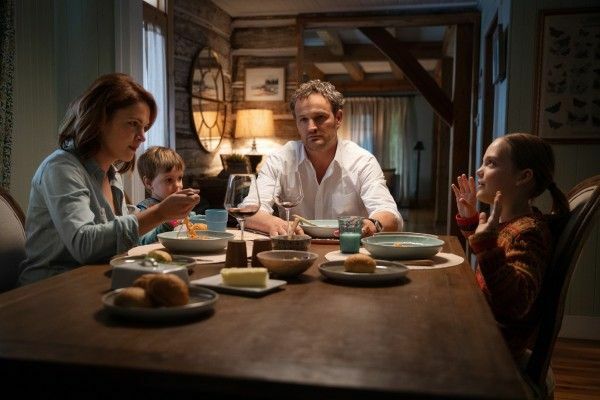 Directed by Starry Eyes filmmaking duo Kevin Kölsch and Dennis Widmyer, Pet Sematary reimagines one of King’s darkest and most beloved tales, taking some big swings with the source material while still honoring the tone of King’s original work. Those changes pay off particularly for Clarke and Seimetz as Louis and Rachel Creed, who deliver phenomenal performances as a married couple faced with ultimate tragedy and terror. Following Pet Sematary‘s premiere at SXSW, I sat down with Clarke and Seimetz for a quick chat about the film. We discussed was scenes they were excited to shoot and which ones they were dreading since they’re both big fans of the book, the vocal crowd reaction to the film’s big moments and the great enthusiasm of the horror crowd, and the exciting storytelling that comes out of the genre space. Check it out in the video player above. As fans of the book, which scenes were they excited about playing and which one were they nervous about? Talk about seeing the film for the first time with the SXSW crowd and the vocal crowd reaction. Talk about the exciting storytelling in horror filmmaking. For more on Pet Sematary, be sure to check out our ongoing coverage in the links below and stay tuned for more spoiler discussions with the cast and filmmakers.